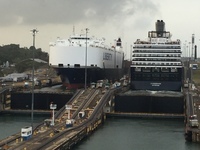 I chose this cruise as I thought my husband would enjoy the Panama Canal. It was great! I was a little worried about reviews complaining about the ship. Do not believe these reviews. It was just fine. I’m sure there are ships out there that are more glamorous but Island Princess was great. Excursions are too expensive on ship. We waited and got tours off ship except in Jamaica and saved money. Following are ones we took and highly recommend all of them. In Turks & Caicos - www.islandtrams.com, Island Trams, 42 Front Street, Grand Turks & Caicos 649-432-TRAM. In Cartagena - rouscartagena09@hotmail.com. In Costa Rica - Oregon Tours with Christian Robinson - Highly recommend you request Christian. We just got off ship and got our tours with groups that will be right there as you get off ship. We were very pleased with all the tours we had. Disembarkation was great. We walked right on ship. No waiting. I think they need more signs however in regards to where to leave luggage if you’re not carrying on board. Also signs on how to get to parking and which way to go to get on ship. We were early to board but our room was ready shortly after we boarded. Disembarkation was smooth and quick. Chose to carry our luggage off ourselves and recommend this if possible. No waiting at all. The service in the dining room was great. My husband is lactose intolerant and he just mentioned it to our waiter and the head waiter was right there talking to him. They had him fill out a menu each night for the next night so they could be sure no milk products in it. The chef made special desserts for him that were great. Our cabin was comfortable and service great. Loved our bed. We have always gotten inside cabins and very pleased with them. Gone from the cabin most of the time so we don’t need the balcony. Entertainment was excellent. Enjoyed it each night. The regulars on ship were outstanding. Great voices. One complaint would be people who put their towels on lounge chair and leaving them there all day so many people don’t get a turn. Have a great cruise! 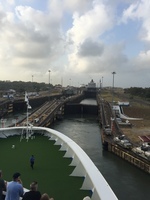 I chose this cruise as I thought my husband would enjoy the Panama Canal. It was great! I was a little worried about reviews complaining about the ship. Do not believe these reviews. It was just fine. I’m sure there are ships out there that are more glamorous but Island Princess was great. Excursions are too expensive on ship. We waited and got tours off ship except in Jamaica and saved money. Following are ones we took and highly recommend all of them. In Turks & Caicos - www.islandtrams.com, Island Trams, 42 Front Street, Grand Turks & Caicos 649-432-TRAM. In Costa Rica - Oregon Tours with Christian Robinson - Highly recommend you request Christian. We just got off ship and got our tours with groups that will be right there as you get off ship. We were very pleased with all the tours we had. Disembarkation was great. We walked right on ship. No waiting. I think they need more signs however in regards to where to leave luggage if you’re not carrying on board. Also signs on how to get to parking and which way to go to get on ship. We were early to board but our room was ready shortly after we boarded. Disembarkation was smooth and quick. Chose to carry our luggage off ourselves and recommend this if possible. No waiting at all. The service in the dining room was great. My husband is lactose intolerant and he just mentioned it to our waiter and the head waiter was right there talking to him. They had him fill out a menu each night for the next night so they could be sure no milk products in it. The chef made special desserts for him that were great. Our cabin was comfortable and service great. Loved our bed. 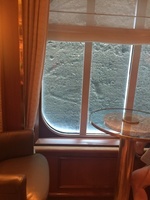 We have always gotten inside cabins and very pleased with them. Gone from the cabin most of the time so we don’t need the balcony. Entertainment was excellent. Enjoyed it each night. The regulars on ship were outstanding. Great voices. One complaint would be people who put their towels on lounge chair and leaving them there all day so many people don’t get a turn.